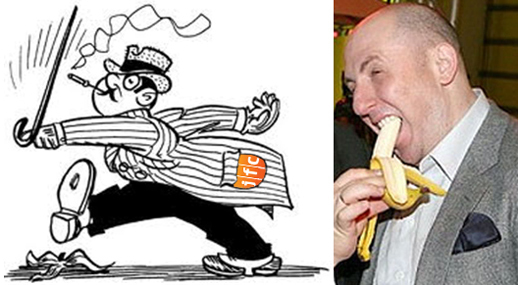 VLADIMIR KEKHMAN DEFAULTS ON UK COURT DEBT — WHO’S THE BIG BANANA IN THE RUSSIAN FRUIT BUSINESS NOW? Joint Fruit Company (JFC), once the owner of Russia’s largest fleet of banana boats and the largest importer of bananas in the Russian market, is slipping on something much bigger than one of its own fruit skins. But the company and its owner, St. Petersburg entrepreneur Vladimir Kekhman, insist everything is ship-shape. More, they say — it’s British justice and five High Court judges who are at fault for JFC’s troubles. Kekhman owns 80% of JFC through Cyprus and British Virgin Island-registered entities, Huntley and JFC Group Holdings. Bank of St. Petersburg owns a 20% stake. Early this month, the European Bank for Reconstruction and Development (EBRD) disclosed that a $50 million loan, which has been negotiated with JFC and apparently agreed almost a year ago, has not been “signed”. An EBRD source declined to say what exactly has halted disbursement of the funds. The tentative loan announcement appeared on December 10, 2010. “All I can say is that no such loan has been signed,” announced Richard Wallis, spokesman for the EBRD in Moscow on September 5. In fact, Star has argued in court, JFC had wanted to exit the fleet operating business after it ran into financial difficulties during the 2008 crisis, and found itself obligated to pay contract rates roughly double the spot cargo market rates offered by a Maersk service between Ecuador and St. Petersburg. Maersk’s new banana delivery route to Russia was inaugurated by Prime Minister Vladimir Putin on March 22, 2010. At that time, Kekhman was reported to be over-leveraged; that he might have pledged JFC’s onshore assets to secure real estate project loans; and that Russian banana prices and thus JFC’s revenues were falling. In addition to canceling the Star vessel charters, JFC had sold five of its own vessels to scrap, and cancelled another 2 new vessel orders with another refrigerated cargo company, Seatrade Reefer of Antwerp . A month after the Kalistad announcement, Star filed an arbitration claim and also a lawsuit in London, applying to the High Court to enforce the payment guarantees issued by JFC for the Kalistad charters. The guarantee documents said, among other things, “we [JFC] hereby certify that our company guarantees the performance of the Charter Party dated 04-04-2008 of m/v Almeda Star, Avelona Star, or Andulucia Star for account of our Nominee, Kalistad Limited, Nicosia.” A guarantee dated July 15 used identical language to promise payment by JFC for Kalistad in the charter agreement for the Cape Town Star. On the signature line of the guarantees there was the signature of Andrei Afanasyev, then titled “commercial director, on behalf of JFC Group, St. Petersburg.” Afanasyev is now identified on JFC’s website as vice president of the JFC group of companies and a director on the group board; he ranks third on the company hierarchy after Kekhman. To stop enforcement in London, Kekhman ordered his lawyers into a St. Petersburg court to argue the guarantees were invalid under Russian law. Star then won an injunction from Justice Christopher Clarke in London, followed by a second ruling from Justice Sir Nigel Teare, who called the Russian court tactics “vexatious and oppressive”. The best JFC could argue in the London court through Steven Gee QC was that governing the guarantees and the payment obligations, “the applicable law was Russian, being the law with which the guarantee was most closely connected”. The High Court rejected that, concluding that JFC had itself opted for UK law and UK jurisdiction for its 2008 contract with Star, and with an earlier one in 2006. The London rulings also indicate that JFC was wrong on Russian law. They add to the suspicion on Star’s part that it was not Russian law, but Russian telephone justice, that may have been the objective of the St. Petersburg moves. In addition to revealing JFC’s attempt at using the Russian courts to avoid paying on its contract, the court papers open up unusual evidence of how Kekhman does his banana business using offshore trading intermediaries. Thus, it is revealed that in June of 2010 a cargo of 156,192 boxes of bananas was shipped from Ecuador by a JFC subsidiary, Bonanza Fruit Co. SA Corbonanza. Part of the fruit cargo was intended to be delivered and sold to a Libyan company in Tripoli, Altafadul. But by the time the Libyans opened their boxes, the bananas were unfit for sale. The Libyan buyers then sought compensation. According to the facts spelled out last month in the High Court by Justice Nicholas Chambers, JFC claimed that before its cargo had reached Libya, it had been sold to another company called Garold Projects Ltd. This entity appears to have no relationship with JFC, Bonanza, or Kalistad, the vessel charterer. So the Libyans arrested the vessel, the Avelona Star, to enforce their demand for compensation. Through Kalistad, JFC said it had no responsibility for what had happened, and that liability to Libyans was owed, not by JFC, but by Star, the owner and operator of the delivery ship. JFC then issued its September 15, 2010, termination of charter contract, adding that blame for “deteriorating of cargo quality, commercial and reputational losses” was entirely Star’s. A month later, the cargo’s German insurer paid the Libyans $600,000 and the vessel was released from Tripoli. Fast forward by nine months and three additional rulings by the High Court to August 23, 2011, when Justice Chambers issued a 21-page judgement on the case. The judge concluded that JFC “guaranteed the performance of the charter parties and it is liable for any failure in such performance.” Kalistad had “wongfully repudiated” its agreement, Chambers said, and as result, the JFC group owed Star $16.245 million in loss of profits, unpaid hire, unpaid pilot fees and port charges, and other losses. JFC claims that it hasn’t seen the ruling. Star’s chief executive Simon Stevens has warned publicly that Russian companies found culpable in the UK courts are on notice that “those who renege on their commitments will properly be held to account.” JFC’s attempts to use the Russian courts to shield itself from contract liabilities have also been taken to task by Star executives, and by the British judges. JFC’s website does not refer to the Star Reefers claim or the court judgements. The most recent performance indicator published by JFC is four years old: “In 2007 JFC Group sold almost 500 000 tonnes of fruit and vegetables. Almost 70% of this was bananas. JFC Group controls more than 25% of the Russian banana market and almost 15% of all imported fruit. According to independent research conducted in 2007 the Group’s banana brand Bonanza! was the most popular banana brand in Russia.” The company’s international credit rating is reported from Standard & Poors as CCC+/Negative; that too appears not to have been updated since the start of the London litigation. If revenues and earnings are not significantly better this year, the size of the High Court payment order may tip Kekhman’s balance-sheet into loss. Lawyers close to the case say JFC and its London lawyers, Swinnerton Moore, had decided not to appear at last month’s hearing before Justice Chambers. After notification of the judgement, they did not lodge an appeal by the court deadline last week. An earlier statement from JFC, dated March 29, 2011, told the market that “JFC Group Co. Ltd. [sic] is pleased to announce the successful closing of a new Club facility coordinated by Raiffeisen Bank…” JFC said it was being loaned $88 million and Rb1.5 billion ($50 million) from a syndicate including Sberbank, the state savings institution of Russia. Also participating were the Russian affiliates of Societe Generale (France), Unicredit (Italy) and Amsterdam Trade Bank. The interest rate is a high one – LIBOR plus 4.25% to 6%, “depending on the leverage ratio of the Group”. The banks do not comment on the due diligence they conducted prior to the loan agreement, or the security pledges for the loan. It is not possible to report whether the banks, including the EBRD, have verified how title to JFC’s banana shipments changes during the shipment process, before reaching their destination. On May 31 of 2010, the Russian affiliate of Nordea Bank of Denmark agreed to lend JFC $15 million. Although Nordea said “no security is envisioned in the facility agreement”, the Danes may have judged that JFC banana transportation by Maersk gives the bank recourse in case of default or covenant breaches. A source close to the London litigation told Fairplay that investigation has recently revealed that title to operating assets of JFC in Russia may have been transferred to foreign shelters in recent months. There has been no response from JFC for a request to clarify the details.